At Tommy Car Wash Systems we work every day to transform the car wash status co, designing better buildings and installing better equipment. But our projects and products aren’t an island, and we owe a lot to the car wash systems and designs of the past. 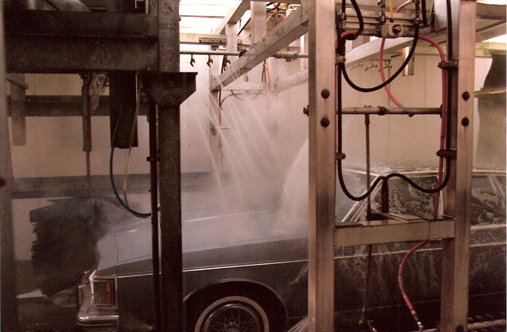 So this post covers a few important points in the History of Car Washes—including our own car wash history and Tommy’s contributions in the present day. Michigan, our native home, holds the honor of being the very first location to host a car wash. Automated Laundry began operations in 1914 in the Motor City, Detroit, and despite the name used absolutely no automated systems. Cars were pushed through a garage manually where workers hand washed the exterior and polished brass components. It was simple, but the concept proved popular among wealthy residents and in the next twenty years 32 similar washes opened up across the United States. Car washes innovated in during the first half of the 20th century, most (but not all) relying on automated pulley systems that hooked under front pumpers, pulling the car through product-line style hand washing bay. In the 1920’s the Chicago Auto Bowl is noteworthy for using conveyor belt floors taken from factories, overhead sprinklers, and a large cleaning pool where drivers would drive in circles to clean mud from tires. There is some disagreement over the first ‘automatic’ car wash, as most added automated systems in stages from the 1920s to 1960s. Automatic and semi-automatic tunnel washes were operating in Europe as early as the 1930s, automatic systems featuring soap sprayers, automatic brushes, and a 50-horsepower blower for car drying were working in the western US in the 1950s, and in 1946 Paul’s Automatic Auto Wash began operating the first automatic system in the United States. By 1955 a number of different car wash franchises were growing fast and a group of car wash industry leaders came together to form the Automatic Car Wash Association, now known as the International Carwash Association (ICA). Less than a decade later, in the 1960s, car washes began taking on familiar shapes and equipment still used today appeared widely on the scene. Water reclamation and recirculation, soft cloth friction cleaning (instead of abrasive brushes), conveyors, rollers, and more began to appear on the scene along with touchless automatic washes. 1969 was also the year that June and Sonny Essenburg began the very first Quality Car Wash on 17th street in Holland, Michigan—a car wash enterprise which would eventually lead to the development of Tommy Car Wash Systems. The modern car wash is in transition—and there are exciting things on the horizon! Today car washes are more diverse than ever with small in-bay automatic car washes, full-service tunnels, express, tunnels, flex tunnels, and self-serve car wash stations that can all be touchless or friction cleaning. But so many options and different price points can confuse consumers and it is up to every single car wash location to demonstrate its value and persuade customers to trust their vehicles, time, and money to the wash process. Tommy Car Wash Systems’ mission is to transform that process, turning carwashes into a local destination and a making car washes a regular part of more people’s daily life. We’ve pioneered industry changing technologies like the chemical POD system, flight deck controls, and dual belt conveyors. We invest huge amounts of time and energy into real world R&D testing and development. All our buildings and car wash designs are made to be stunning, our loading process is simple and straightforward, our wash times are fast, and our systems are easy to control, maintain, and operate—and will stay that way for decades to come. Car washes have come a long way, and we can’t wait to show you where they’ll go in the future. That was really interesting reading about the history of the car wash. It seems they have come a long ways over the years. The touchless car wash is a huge advancement over having people manually push your car through! It’s so fascinating seeing the history of car washes! The first one is so rudimentary compared to today’s technology. I sure am grateful for the car washes we have today, though, because my car would not be washed as often if I had to do it myself all the time!